The intriguing repeat of basic stitches in this chunky crochet triangle scarf will hold the interest of beginning and more experienced crocheters alike. Get the complete free pattern below or purchase the ad-free, printable PDF with visual stitch chart for $2.99 here. This chunky crochet triangle scarf pattern is part of a collaboration with Lion Brand Yarn. This post contains affiliate links. Delicate eyelets meet chunky yarn for an explosion of texture in this monochromatic, very wearable wrap. 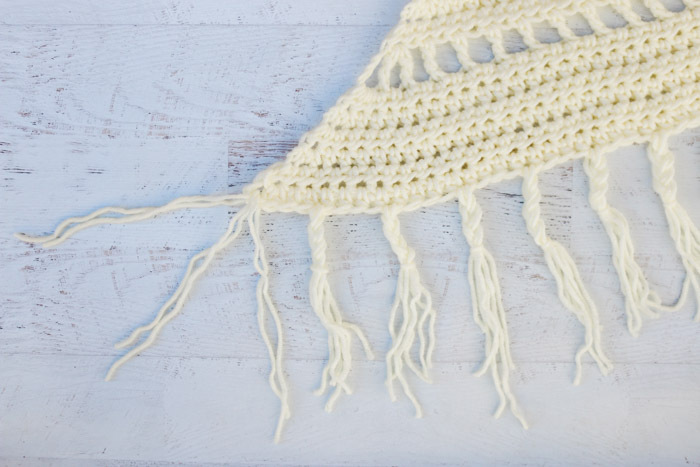 Wear it as a shawl or a scarf, add fringe or tassels, customize the size by adding more repeats–this chunky crochet triangle scarf pattern is rich with possibilities for personalization! Read on for all the juicy yarn and pattern details or scroll down for the complete free pattern. Last week I shared the first of three pattern in a series I’ve made with Lion Brand’s new Color Made Easy yarn. (If you missed the Haven Cardigan in all it’s bobbled, beginner-friendly goodness, you can check it out here.) Next week, I’ll be sharing the Quad Color throw in a baby blanket size and a couch throw size. 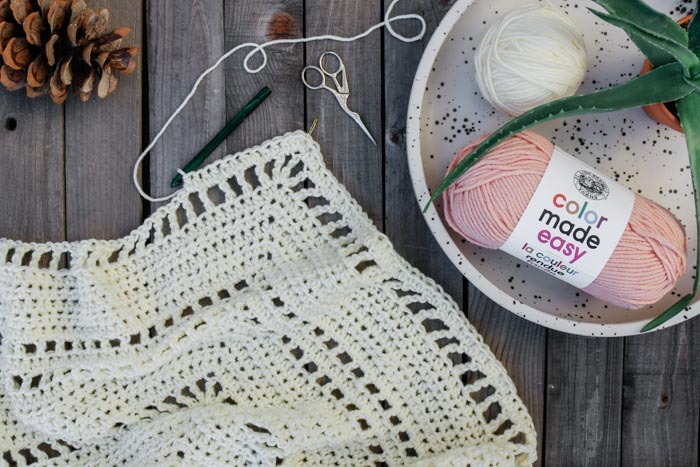 Color Made Easy is a now available at select Michaels stores and on Michaels.com, which is so exciting because it’s a yarn I can really see myself using for impromptu crochet gifts, and let’s be honest, a whole lot of projects I have planned just for myself. I love being able to run to a store and stroke all the colors in real life. I’m guessing you might be able to relate to experiencing the divine project inspiration that can strike in the yarn aisle at Michaels! 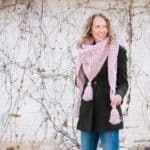 For the Whisper chunky crochet triangle scarf design, I really wanted to focus on texture so that crocheters could choose from the gorgeous shades of Color Made Easy to find one that suits your own personal style. I’d love to make another one of these wraps in Avocado or Basalt. Wouldn’t that be pretty? 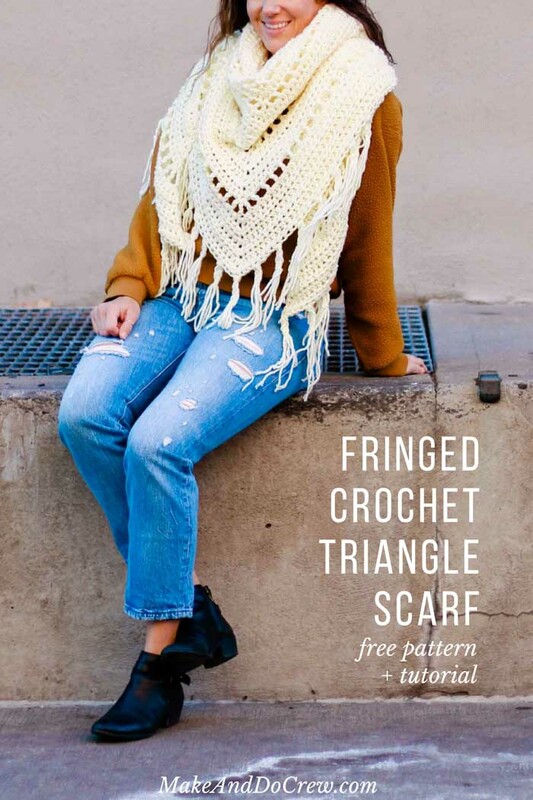 Who Can Make This Chunky Crochet Triangle Scarf? Because this pattern is made with a simple combination of half double crochet, double crochet and treble crochet, it’s really pretty easy. Once you have the first eight or so rows figured out, you’ll be off to the races and just repeat those techniques in different ways throughout the pattern. 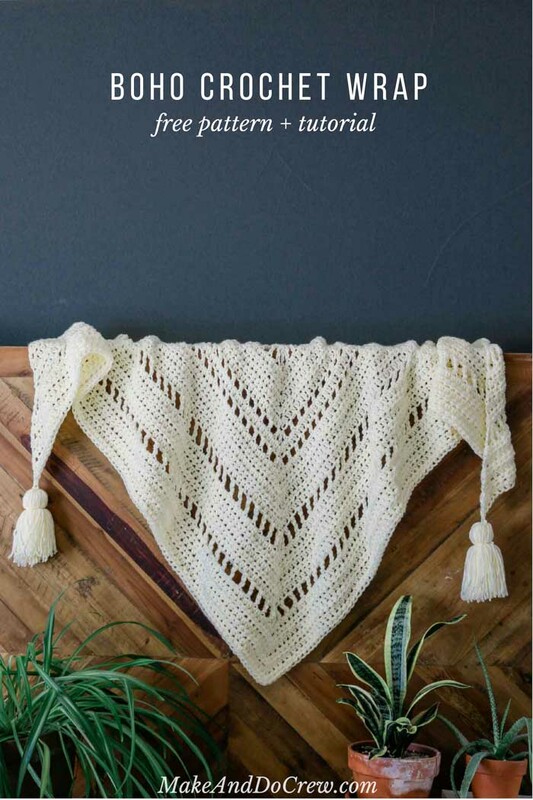 I often find that for slightly lacy crochet patterns like this triangle wrap, a stitch chart can be super helpful. 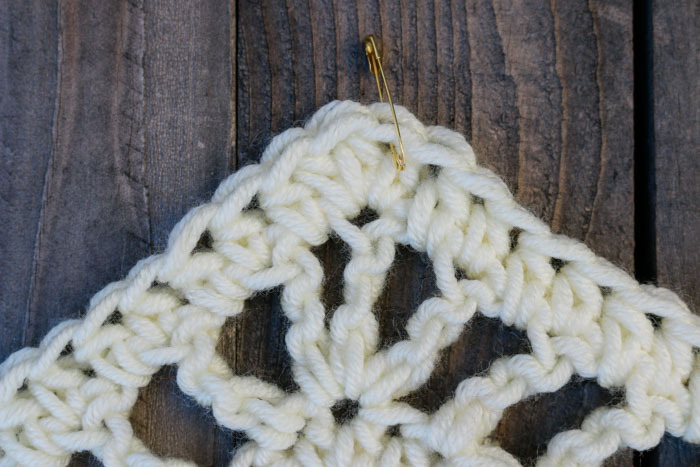 Crochet pattern lingo is so wordy sometimes and the simplicity of a visual stitch chart can make all that writing so much quicker and easier to digest. In the ad-free, printable PDF, you’ll find a thorough stitch chart along with the written pattern and photo tutorials, so that no matter your skill level or how you like to learn, you’ll be covered. You can grab the printable PDF for a few dollars here. 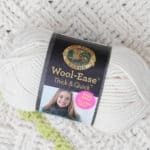 Sometimes all it takes to finish an awesome project is having the supplies to get started, so I’m really happy that Lion Brand has turned the Whisper Triangle Scarf pattern into a crochet kit. In one fun box of happy mail, you’ll receive all the Color Made Easy yarn you need, plus a printed copy of the pattern and stitch chart. You can order yourself a kit here! 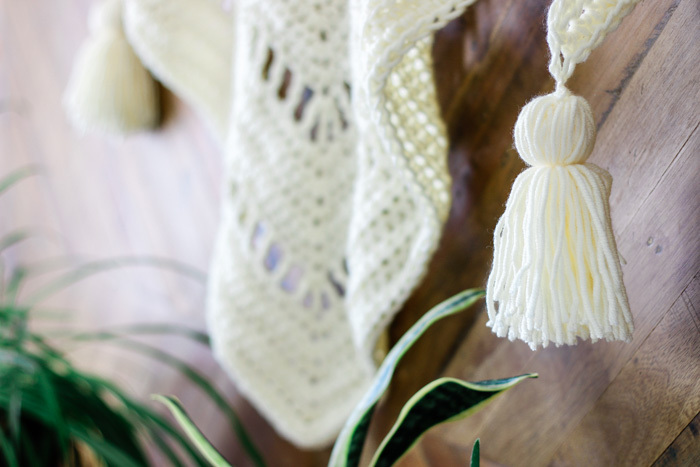 If your neck is chilled or you just need a quick crochet project, we have no shortage of ways to scratch your scarf itch. 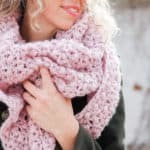 Check out all our free crochet scarf patterns here including lots of cowls, wraps and shawls, many of which contain video tutorials. After finishing this chunky crochet triangle scarf, I realized my friend Alexi from Two of Wands had made a very similar version a while back using even chunkier yarn. 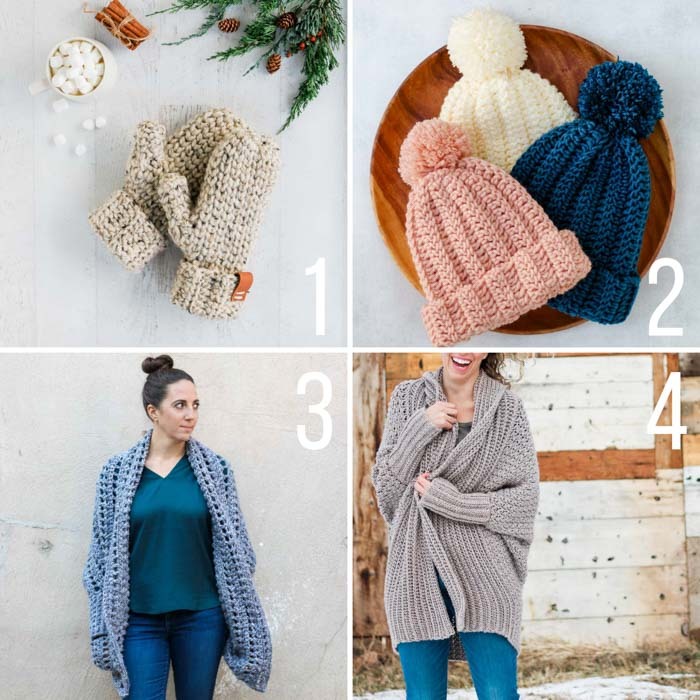 Her pattern is definitely worth checking out too–and while you’re there, follow her on Instagram for all the crochet and knit inspiration your eyes can handle! Okay, ready to make a chunky crochet triangle scarf?! Let’s do it! Save this pattern to your Ravelry here. Delicate eyelets meet chunky yarn for an explosion of texture in this monochromatic, very wearable wrap. 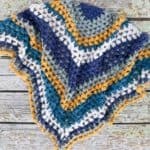 This interesting repeat of basic stitches means this chunky crochet triangle scarf will hold the interest of beginning and more experienced crocheters alike. 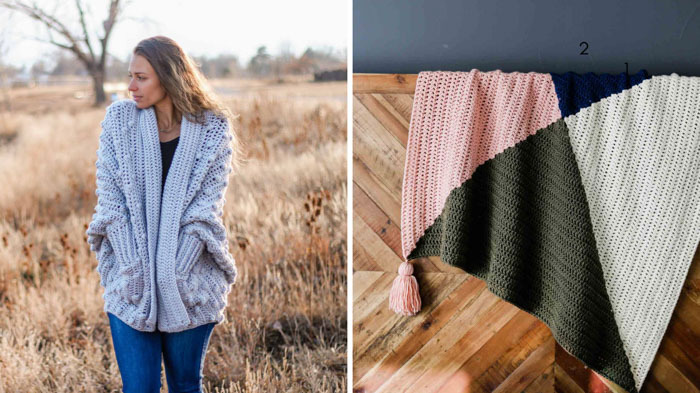 Wear it as a shawl or a scarf, add fringe or tassels, customize the size by adding more repeats–this approachable pattern is rich with possibilities for personalization! Purchase a kit with all the yarn you’ll need + a printed copy of the pattern here! • Reference stitch chart at end of ad-free pattern PDF for visual explanation of pattern. • It can be very helpful for counting to place a stitch marker in the center stitch of each row. Move marker up as each row is worked. See photo below. • Ch-2 at beginning of row does not count as hdc. Ch-3 at beginning of row always counts as a dc. Ch-4 at beginning of row always counts as a tr. Work all of these series of chains loosely so as to ensure scarf lays flat at edges. Similarly, work last st of row quite loosely as well. Foundation Round: Ch 4, sl st to first ch to join. Ring formed. Rows 9-12: Rep Row 2. Stitch count should increase by 4 sts per row, giving 61 hdc after Row 12. Fasten off. Leave marker in center stitch if planning to add braided fringe. See video below for a visual tutorial. Using a cardboard tube cut to 6.25” (or a tassel maker), wrap yarn approximately 65 times around the tube lengthwise. Insert a 10” piece of yarn underneath wrapped yarn on one end of the tube. Tie a few secure knots, but do not trim these pieces. Use scissors to cut the wrapped yarn at the other end of the tube. Fold the resulting strands of yarn in half and wrap a second 10” piece of yarn around the top of the strands to create a small sphere of yarn. Insert hook through bottom of tassel to grab these tails and hide them in the tassel. Use the tails from the first 10” piece of yarn to tie the tassel to corner of scarf and weave in ends. Repeat for opposite corner. See photo below for a visual example. Cut pieces of yarn to approx. 14”. >Tip: It can be helpful to wrap yarn around an appropriately sized book several times and cut to create a lot of fringe of the length size quickly. Beginning at center triangle point (marked stitch) thread three pieces of yarn through hdc stitch. Loosely braid these pieces of yarn for 1.5-2”. Wrap one braid tail around entire braid and tuck tail through resulting loop to tie off. Skip 3 hdc sts and repeat braiding process in fourth st.
Rep along both sides of triangle. Bundle up in your new handmade scarf and head out to find some snow (or yarn for your next project)! 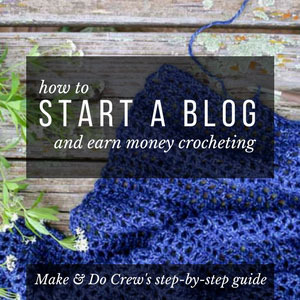 Ready to get on a crochet roll? We have so many more free patterns, many of which are much easier than they look. Here are a few reader faves! WANT MORE FREE SIMPLE SCARF PATTERNS? 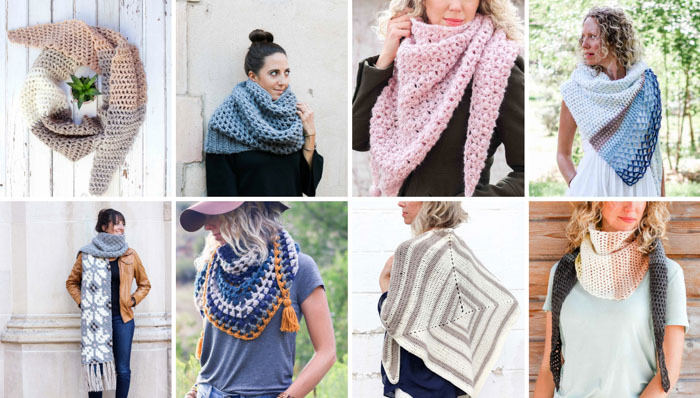 If I make two of these Shawl / scarves , would it make a poncho? Gosh, what an interesting question. 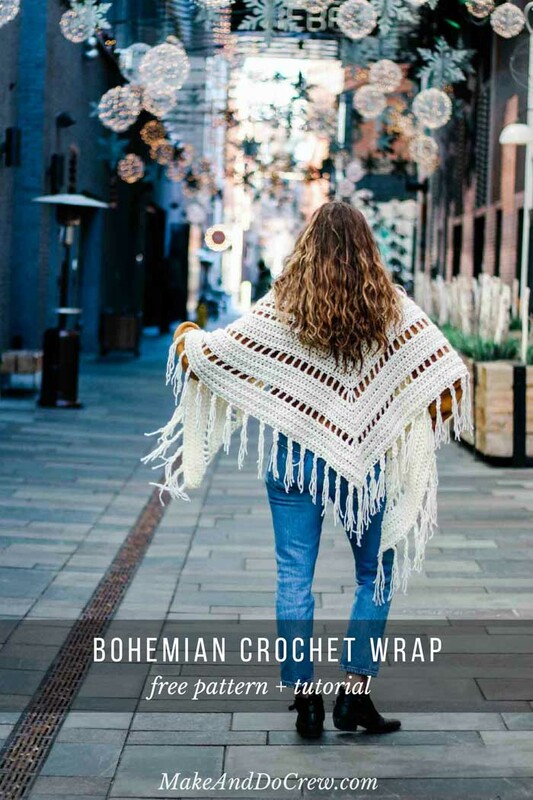 I do believe you could fashion a poncho out of two shawls by seaming together the tops of the triangles and leaving a space for a neck opening. Is that what you were thinking? I’d love to see a photo if you try it! Scarf looks cool. I am trying it to make. Thanks Ian. I hope you enjoy!